Define your brands Vision, build your future. If you don’t know where you’re going, you’ll end up somewhere else. And that somewhere might be a place you don’t want to be! Setting your company Vision specifies the place you want your brand to be. It’s a descriptive picture of what success looks like some time in the future. And if you know where you’re heading, it’s easier to plan the signposts (goals) that show you’re getting there. Its intention (alongside your Purpose) is to inspire, motivate and align your employees. So it’s important you connect it to the various tasks and projects you perform wherever possible. This keeps your Vision at the forefront of everyone’s minds and work. Maybe you want to be the biggest player or set up a not-for-profit arm – whatever you strive for – your Vision determines your customers and employees. So put thought into it and don’t be afraid to improve it whenever required. 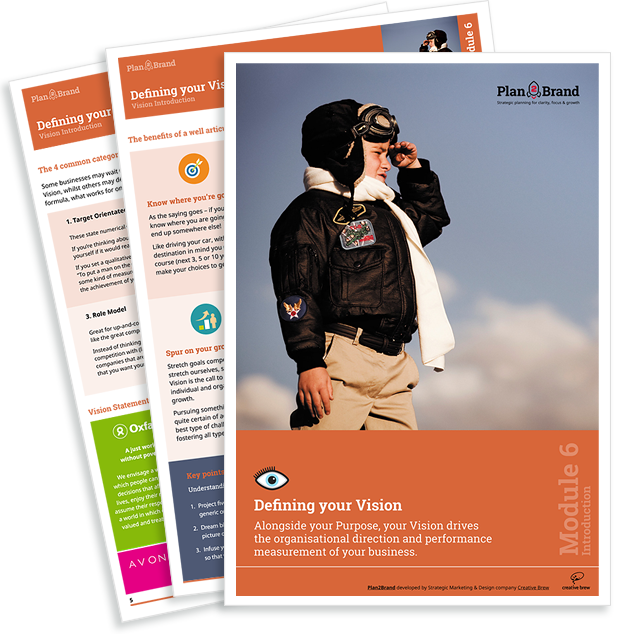 How Vision and Purpose work strategically together in practice for a couple of well-known brands.